Save up to 70% automatically with Lifetime Pricing. Our system automatically calculates your pricing which is derived from the amount you have spent on products with us through the years. Simply said: the more you order, the more you save. If you decide to sell your calendar in our online store, any store orders you receive will get counted towards your LIfetime Pricing. For example: Let's say you order one copy and you sell 9 copies from the store, your Lifetime Price will be at the 10 quantity pricing tier of $19.99. 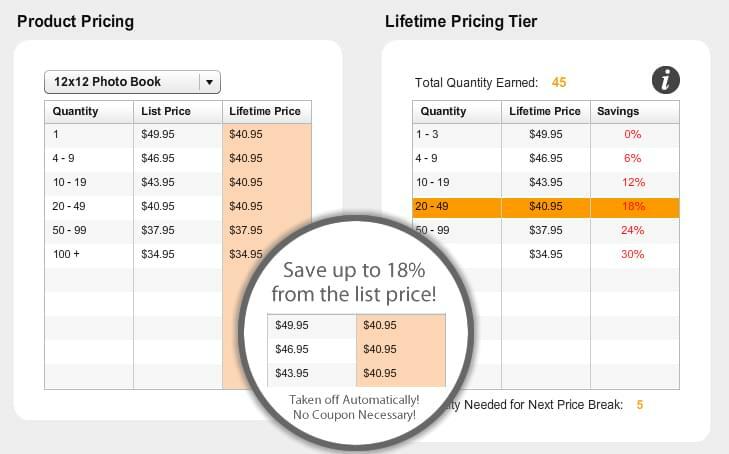 In the example below the customer has ordered 45 12x12 Photo Books which puts their Lifetime Pricing at the 20-49 Tier which is 17% savings and a cost of $43.95 instead of $52.95 per book. If they were to order 5 more, this would bump them up to the 50-99 tier and their price would drop to $42.95 per book and 19% savings. The more you order, the more you save and this is forever as we don't restart your quantity's from year to year.